We think in words so you should always speak to your baby in detail about the world around them and what you are doing. Include as much detail as possible and point as much as possible or even better touch the object you are talking about. Your baby will love this, it is showing them something new and they are developing new synapses as you do this. Early language skills are directly related to ability for reading and writing at school in later years. Always look for new opportunities to show your baby something new. I.e. go around the room and point / touch objects and tell them about it. Do this for all the rooms in your house. Outside, touch leaves, bark, grass, anything and everything this is build a picture of their world and they will understand much more than you give them credit for. As they get older anything they show an interest in foster this interest as much as possible e.g. If they see a train and great interest, take them to a train station, look at trains in books, toy train, pictures of trains in their room etc. 80% of intelligence and brain development is in the first 4 yrs. The well known fact now is that by the time children get to preschool it is too late! Research has shown that babies are born with the ability to distinguish all the possible sounds of the world’s languages. Important changes in your baby’s perceptual abilities occur toward the second half of her first year of life. During this period, your baby becomes attuned to the sounds of the language around them and they lose the ability to distinguish other, foreign sounds they were able to perceive just a few months earlier. When the sounds do not exist in the language around them your baby will not hear them. When it comes to sounds, your baby’s perceptual system is most acute in the first year of life. Important neural circuitry is established during this period and these connections lay the foundation for future language learning. Although some of the neural pathways that are laid within the first year of life may be reversible or established later in life, others are not. For languages, and especially for their sound systems, early exposure is essential. The best strategy for optimizing your baby’s linguistic abilities, then, is to expose her to languages as early as possible. There are windows of opportunity in learning called “critical periods”, during which your baby can learn skills with ease and perfection. When these windows shut, they shut tightly and often irreversibly. If a skill has not been acquired before the critical period, learning it becomes difficult, or sometimes impossible. When it comes to learning a second or third language, your baby’s first year of life is equally crucial. Babies are born poised and ready to learn any language in the world. For the first year of life, your child will have an uncanny ability to hear sounds in foreign languages with perfect clarity and precision, a skill he will all but lose by his first birthday. However, if he is surrounded continually with sounds of foreign languages while his language window is open, he will have a head start on learning multiple languages and on speaking them without a foreign accent. A child needs to hear 1000 read aloud before they begin to learn to read for themselves. At 3 a day, they have 1000 in the first year! 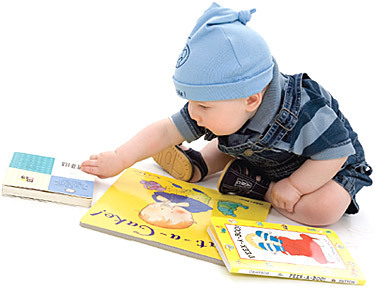 The best time to start reading aloud to a baby is the day it is born. The more expressively we read, the more fantastic the experience will be. The more our kids love books the more they’ll pretend to read, the more quickly they’ll learn to read. Babies can always understand much more than you think they can. So ensure that you always speak in a respectful manner to your baby (good rule is to speak to your children how you would like other people to speak to them) , explaining as much as possible and in as much depth as you accurately can about what you are doing and what they are seeing. Monitor your language that you use to describe your baby and their behaviors/ activities, when speaking to other people. Try to use positive words and banish the negative ones. Never criticize your baby or take notice of what they are doing that’s wrong. This will ensure that this behavior is repeated, you build their self esteem and the words you are speaking are positive then that is how you will feel. So focus on the positive. Focus on the times of the day when they have co-operated and been happy rather than the small / short periods of fussing. You need to expand this technique to every area you can possibly think of, eliminate “Don’t…..” from your vocabulary. Later when your baby understands everything you saying, not saying “don’t” will be important. E.g. “Don’t fall out of the tree” child interprets “fall out of the tree” rather say “ hold on tight” “Be careful” Or “Don’t drop that glass” your child then starts to imagine dropping the glass and is more likely to do so. Teach them to succeed with what you say, not to fail . Be careful even with the books you read to young children even Jack and the Beanstalk has “you stupid child” when Jack came home with the beans.